G2 Crowd, the world’s leading business software review platform, today released the Fall 2017 CRM Software Grid® report to help businesses make the best CRM technology buying decision. Salesforce CRM, HubSpot CRM, Pipedrive, and Zoho CRM were named Leaders in the report, receiving a strong customer satisfaction score with a large market presence. Freshsales, ProsperWorks CRM, Nimble, PipelineDeals, Less Annoying CRM, Base CRM, Salesnet, Nutshell, Pipeliner CRM, OnePageCRM, Workbooks.com, bpm'online, Salesflare, amoCRM, InfoFlo Software, Bullhorn CRM, Vtiger CRM, Redtail CRM, Salesbox, Relenta CRM, Insightly, Prophet CRM, Membrain, Contactually, Really Simple Systems, Maximizer CRM, NetHunt CRM, Efficy CRM, Cosential, Close.io, iSEEit, and LeadSquared CRM were named High Performers in the report, earning strong customer satisfaction marks with smaller market presence scores. Salesforce CRM and Hubspot CRM tied for the highest overall satisfaction score while Salesforce CRM earned the highest overall market presence score. This report also breaks down the CRM category, based on market presence and customer satisfaction score, for Small-Business, Mid-Market, and Enterprise reviewers. At the small-business level, Pipedrive and ProsperWorks CRM tied for the highest overall satisfaction score and Salesforce CRM earned the highest overall market presence score. In the mid-market segment, Salesforce CRM received the highest overall satisfaction score and earned the highest overall market presence score. Finally, at the enterprise level, Salesforce CRM earned the highest overall satisfaction score and the highest overall market presence score. Integration issues — Many users discussed the lack of integration between CRM solutions and third-party services; some users mentioned that the tool they used didn’t have the ability to support APIs, either. Users said that they struggled when they wanted to sync customer information and data with other tools such as marketing automation or applicant-tracking systems. Many users explained that the biggest hurdle when utilizing CRM solutions—aside from the expected learning curve—was the difficulty in customizing them to work well in their environment. Difficult-to-use interface — The majority of users mentioned that the interfaces of CRM solutions are outdated and clunky. Some of the users admitted that that dislike may be minor, but others explained that an unintuitive UI makes the tool difficult to use. Users said that the solution’s layout can be scattered and unintuitive, which results in an unnecessary number of steps to follow to simply input or pull data. Users said that when they’re faced with an excess of options, it becomes difficult to train new users and makes reporting and tracking data cumbersome. The report is based on more than 9,023 reviews written by business professionals. 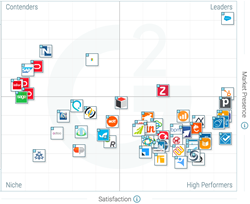 Of the 195 products listed in G2 Crowd’s CRM category, the ranked products each received ten or more reviews to qualify for inclusion on the Grid®.